Hungarian sculptor; born in Arad 1811; died in Vienna April 28, 1860. In his early childhood he carved toys, and in 1833 went to Vienna to satisfy his artistic cravings. Here he became an engraver, and worked for three years with his burin. He then received a scholarship from Prince Metternich, which enabled him to study at the Vienna Academy of Fine Arts. He remained here until 1843, receiving awards for an embossed profile in wax of the emperor Joseph II. and for a steel-engraving of Metastasio. In 1844 Guttmann produced a bronze statuette of Baron Solomon von Rothschild from a portrait, and was commissioned by the baron to execute a replica in marble. 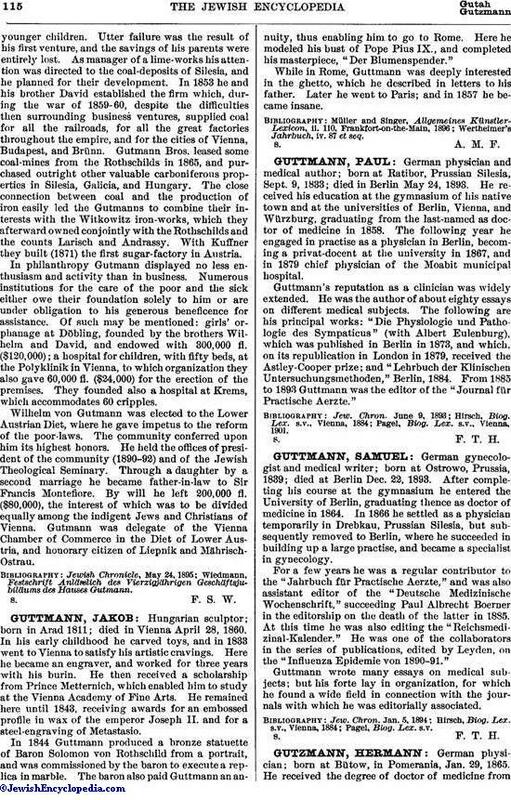 The baron also paid Guttmann an annuity, thus enabling him to go to Rome. Here he modeled his bust of Pope Pius IX., and completed his masterpiece, "Der Blumenspender." While in Rome, Guttmann was deeply interested in the ghetto, which he described in letters to his father. Later he went to Paris; and in 1857 he became insane. Wertheimer's Jahrbuch, iv. 87 et seq.